Tidal barrages work like a hydro-electric scheme, But that the dam is much bigger. A huge dam or a barrage is built across a river estuary. When the tide goes in and out, the water flows through tunnels in the dam. 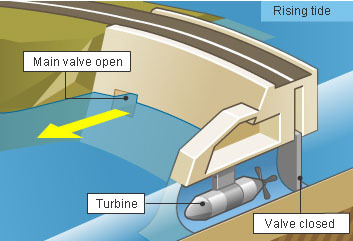 How does a tidal dam work? As the tide comes in, the dam allows the sea water to pass through into a holding basin. As soon as the tide is about to go down, the dam is closed. The water held back in this way will be used to feed the turbines at low tide. 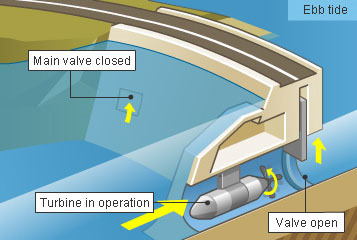 The ebb and flow of the tides can be used to turn a turbine, or it can be used to push air through a pipe, which then turns a turbine. Large lock gates, like the ones used on canals, allow ships to pass. There would be a number of benefits, including protecting a large stretch of coastline against damage from high storm tides, and providing a ready-made road bridge. However, the drastic changes to the currents in the estuary could have huge effects on the ecosystem, and huge numbers of birds that feed on the mud flats in the estuary when the tide goes out would have nowhere to feed. The largest tidal power station in the world (and the only one in Europe) is in the Rance estuary in northern France , near St. Malo. It was started in 1966 completed in 1967. The plant consists of 24 bulb type turbine generators 5.35 metres in diameter, 470 tonnes in weight, and rated at 10MW each which generate electricity whether the tide is going in or out. The tidal range (the difference between high and low tides) averages 8 metres and reach up to 13.5 metres. It generates 544GWh electricity per annum. In addition, the barrage carries a dual carriageway road and shortened the distance between St. Malo and Dinard from 45 km to 10 km. 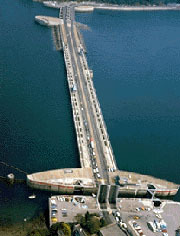 Access for shipping is provided by locks and a swing bridge on the west bank of the estuary. This is an idea for building a barrage from the English coast to the Wales coast over the Severn tidal estuary. 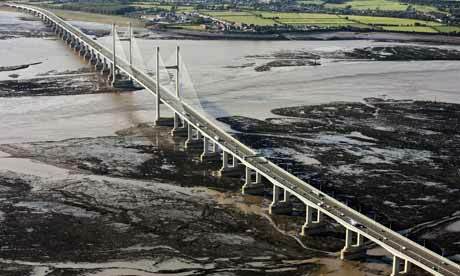 Ideas for damming or barraging the Severn estuary and Bristol Channel have existed since the 19th century. The purpose of such a project has typically been one, or several of: transport links, flood protection, harbour creation, or tidal power generation. In recent decades it is the latter that has grown to be the primary focus for barrage ideas, and the others are now seen as useful side-effects. The UK Government is currently undertaking a Severn Tidal Power Feasibility Study which will consider all tidal range technologies (including barrages, lagoons and others) in the Severn estuary.